According to Kitty Koster, Director of Catering, and Margaret Slaton, Event Planner for Hearty Boys, the look of all white with silver using our brand new White Light Bridge, White Lacquer Highboy and White Chiavari Bar Stools is a refreshing contrast to all the gold and copper used during this holiday season. 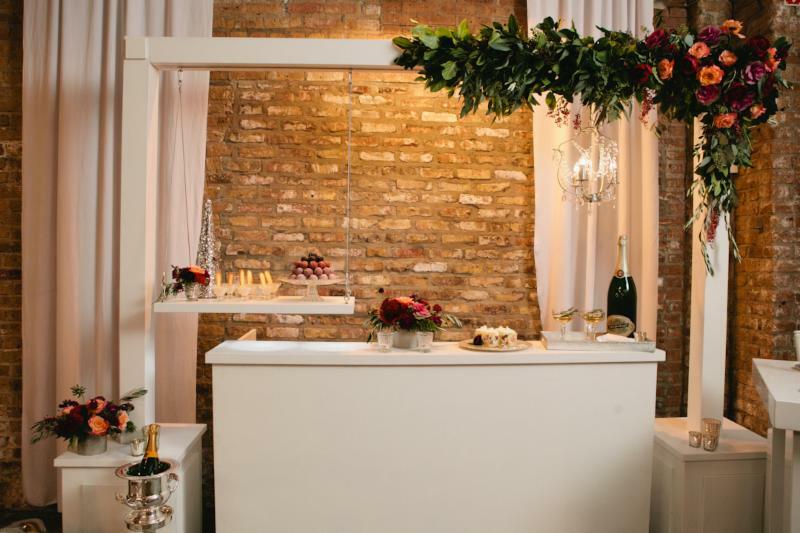 The battery operated Light Bridge is framing our White Bar Surround that is used as a buffet table. It may also be used to hang shelves and draped as Lynn Fosbender, Owner of Pollen has done with her floral décor. The women's focus on the details as well as the entire picture helps create a story. 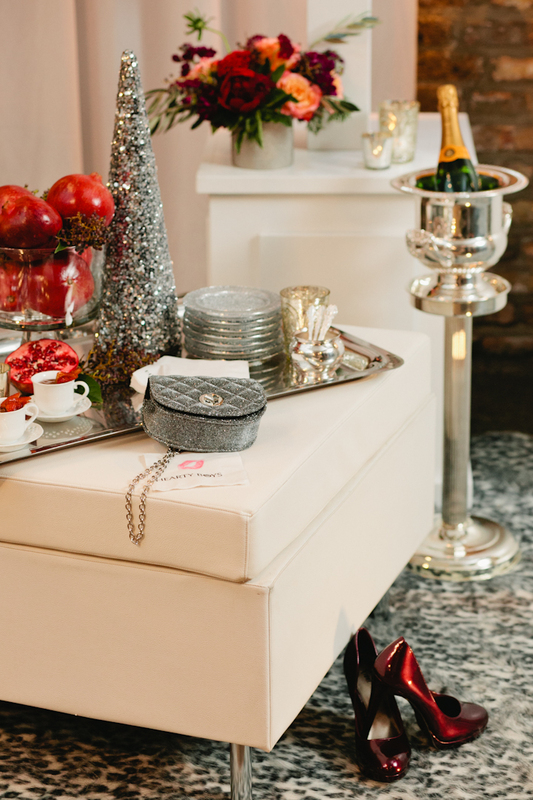 Their creation is entitled "Glam Girls Holiday Night Out", hence the plum patent leather shoes and a sparkly evening bag found on our White Modular Ottoman, here cleverly used as a buffet. Kitty loves the design aspect and had such fun selecting rentals; she definitely liked our term "playing house" when putting together the look in our showroom. In the details they created, there is even a half-eaten macaroon. If you look closely at the cocktail napkin, there's a big red kiss on it. 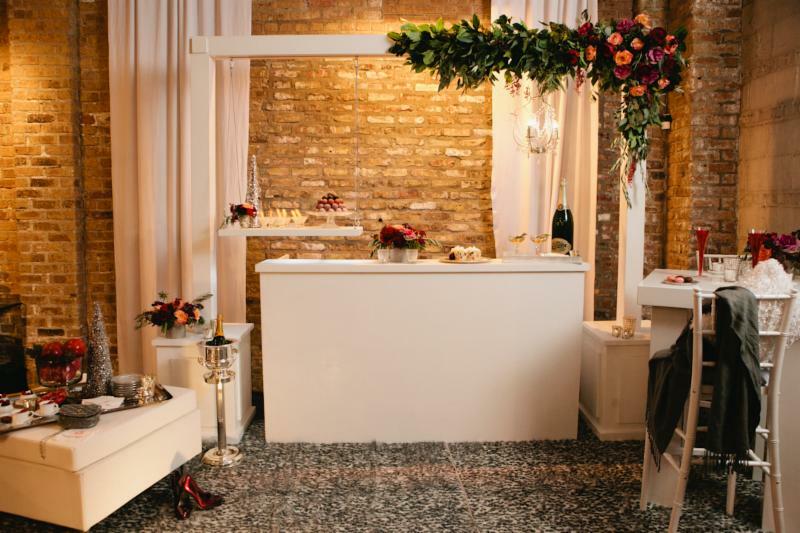 This vignette is a message to all of us in the special event industry during this busy, busy time to "kick off your shoes, relax in style and take time to enjoy your friends". 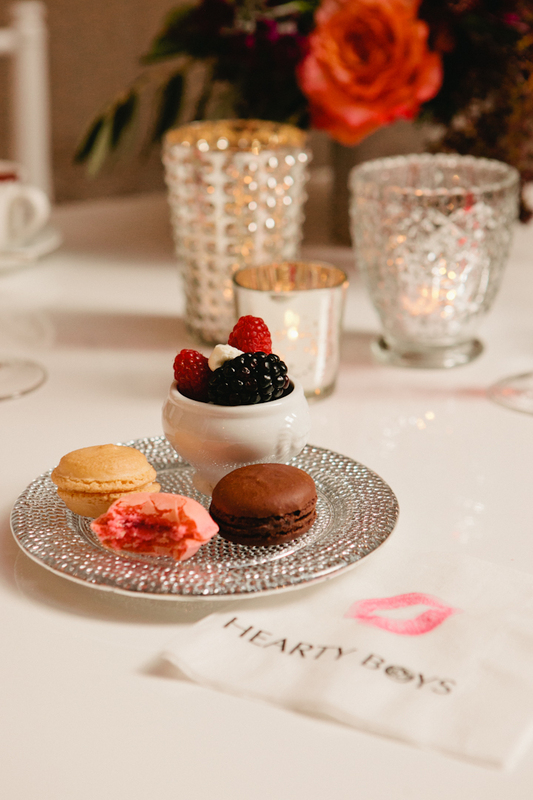 Minis abound with Hearty Boy's array of dessert decadence. Pictured here is their panna cotta with almond tuile in our new, Fluted Edge Taster Tini glass. Their berries-in-cream in our White Porcelain Mini Lion Head Bowl fits perfectly on top of our White Cutout Lace Demitasse Saucer. 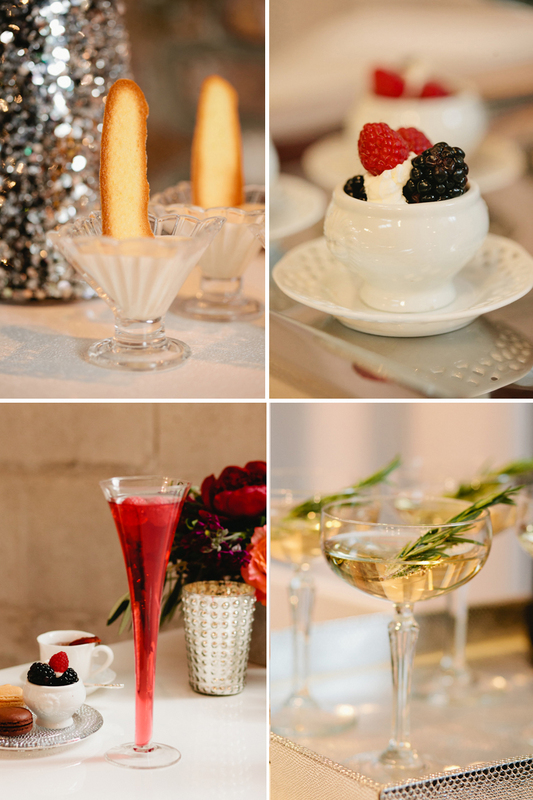 Of course, the champagne is flowing in our Cocktail Coupe and Hand-Blown Trumpet Flute. 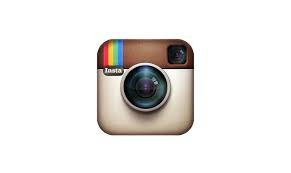 How do they keep up with trends and get inspiration? Margaret views over 20 blogs regularly in the fashion, food, special events, Chicago and international weddings, home décor and even DIY craft fields. Margaret's tip on how to keep up with so many is Feedly, the popular RSS and blog reader. With the clean, white look of the Light Bridge, the off-center floral arrangement on top really pops and softly frames our Crystal Chandelier. Lynn proudly said there was absolutely no Oasis used in putting together the green garland. Her company is very eco friendly. Since there is formaldehyde in Oasis and it is not biodegradable, she never uses it. She does use local flowers as much as possible, has her surplus leaves and stems picked up by Collective Resource for use as compost and donates all of her centerpieces to a community center where people take home the flowers after their functions so her arrangements actually get triple use. According to Kitty, a current display trend is the use of ombre. 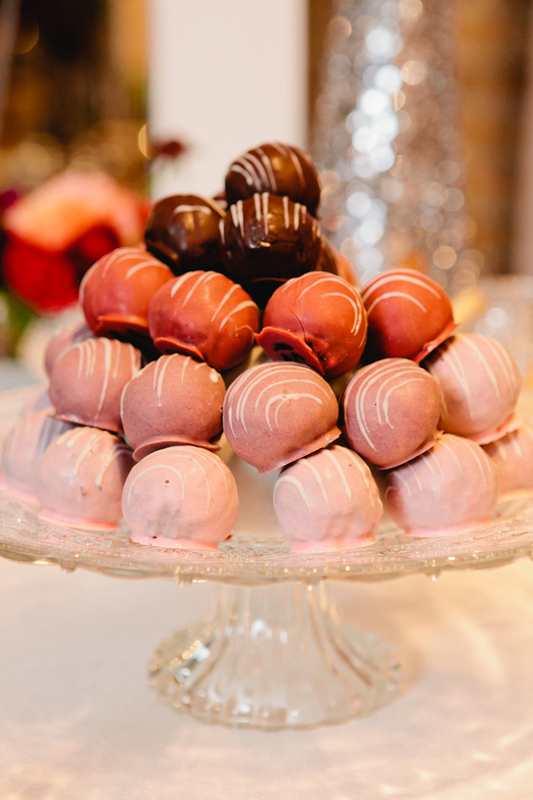 You can see the graduation of color in the pyramid of their cake ball tree on top of our Vintage Glass Pedestal Plate. We think that the food is captured so enticingly by Anna Guziak's photographs. When we sat down with everyone to discuss creativity, and asked Anna the source of her inspiration, she just smiled and said it's from the heart. 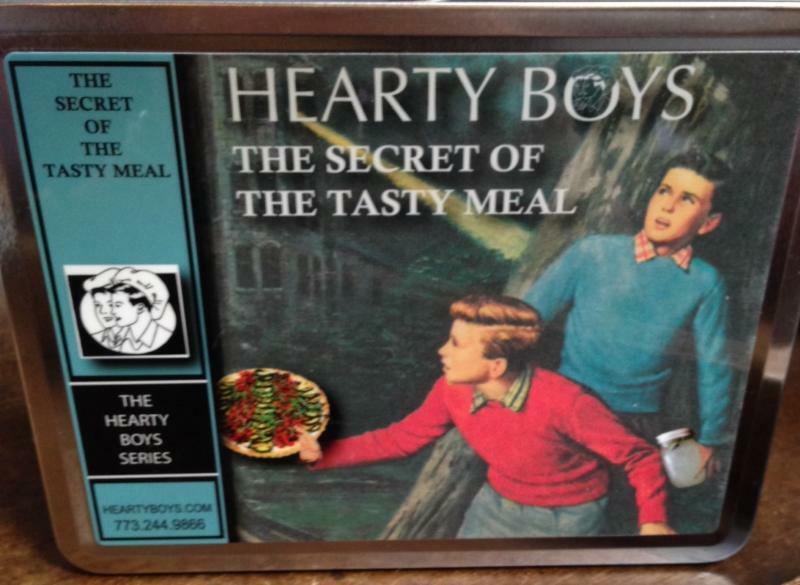 Hearty Boys has been in business for 15 years and is a well-known name nationally thanks to their Food Network TV show and their books, Talk with Your Mouth Full, and The New Old Bar. The play on the name on the old mystery series, the Hardy Boys continues. Owners, Dan Smith and Steve McDonagh, loved the series as kids, love entertaining as adults and keep their company philosophy of food and fun alive with promotions and gifts to customers, like this recent one which is an old fashioned lunch box showing off their philosophy of something well known like comfort food (or a lunch box)-but then adding a twist! Happy Holidays from us all! Here's hoping you take a little time to kick off your high heels! !